Because your immune system is naturally weaker during pregnancy to allow for a healthy pregnancy (your baby is, after all, literally a "foreign body"), you're more likely to catch a flu as well as at an increased risk of suffering complications like bronchitis and pneumonia. What kind of impact can influenza have on your growing baby, though? Is it possible to suffer a miscarriage as the result of the flu? Google this, and most results will be focused on the safety of the flu vaccine in pregnancy, rather than influenza itself. That's a shame, because you'll want to know just how serious the flu can be during pregnancy to allow you to make an informed decision about whether to get a flu shot. Fever, as the result of any cause, during pregnancy has been found to come with a certain risk of neural tube defects and heart defects. This is why expectant mothers who have a fever will typically be advised to take acetaminophen (Tylenol/paracetamol) to lower any fever they have. 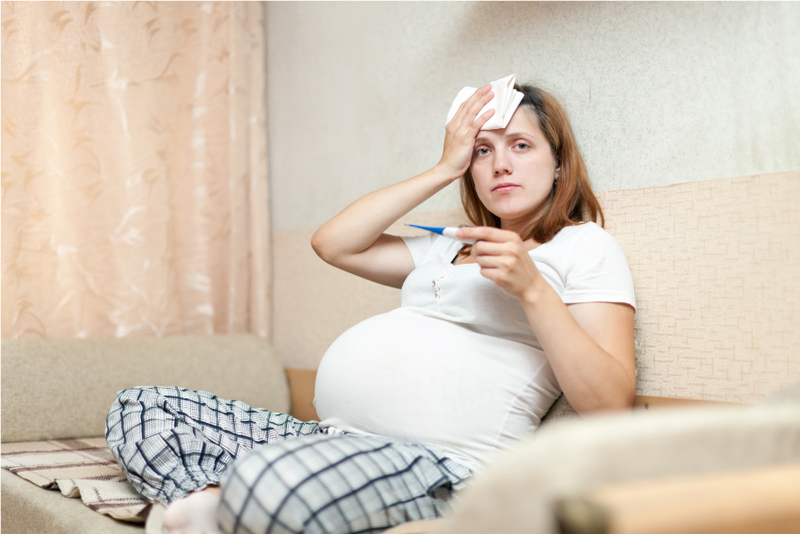 A fever is one of the flu's most typical symptoms, so this is one aspect of why the flu can be dangerous during pregnancy. Research also, however, indicates that having the flu during pregnancy may lead to premature birth. Can the flu also lead to pregnancy loss? Studies show that this is indeed a possibility, with higher rates of miscarriages being reported during both recent and less recent pandemic flu outbreaks. One paper reported that a 20-week pregnant woman suffered a miscarriage after contracting H1N1, a subtype of the A strain of influenza. She was previously in good health and there was nothing unremarkable about her pregnancy. The flu virus crosses the placenta and causes inflammation within the uterus and fetus, so it's not just the swine flu that can potentially lead to miscarriage. It is not currently clear exactly how great this risk is, but it exists. Does this mean that I need a flu shot during pregnancy? It sure does. The US Centers for Disease Control strongly believe that any person over the age of six months should receive a flu vaccine, so that includes vulnerable groups such as pregnant women as well as everyone else. Even in countries where the flu shot isn't routinely recommended to everyone, such as the United Kingdom, however, pregnant women are deemed to be so at risk of flu complications that they are advised to receive a vaccine. The flu shot doesn't guarantee you will not catch influenza, but even if you do, the disease is likely to be milder and your symptoms will last less long. It is best to get your flu shot at the beginning of the flu season — October in most countries — regardless of the trimester you're in. Pregnant women who were vaccinated against the flu have about half the risk of developing a respiratory infection if they catch influenza anyway. You're also 40 percent less likely to need hospitalization. If you are still doubtful, you might also like to know that a new study presented in 2019 confirms that seasonal flu shots do not induce miscarriages. One possible exception can be found in women who are receiving the H1N1 shot the second year in a row. Those receiving this shot for the first time have no such concern, however. What if you get the flu while pregnant anyway? If you believe you have spotted the tell-tale signs of flu — a sore throat, nasal congestion, a fever, body aches, chills, and extreme tiredness — while you are expecting a baby, let your doctor know right away. You can receive antiviral medications like oseltamivir within the first 48 hours to reduce the severity and duration of your flu symptoms. The fact that they require a prescription is one good reason to seek medical attention, but it is also important for your doctor to keep an eye on your condition. Before seeing your doctor, it is generally safe to take acetaminophen to bring your fever down.